This is a series my 1st grader and I have been enjoying together. I found them when I was looking up Annie Barrows, having read 2 of her adult books: The Guernsey Literary and Potato Peel Pie Society, and The Truth According to Us. I had no idea she also wrote middle grade fiction! They are right on target for my 7-year-old's reading level and the situations are things she can relate to, as well. 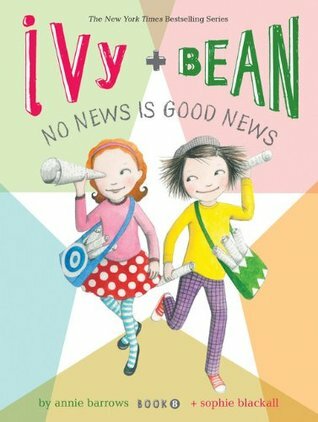 There are usually 11 or 12 short chapters, with plenty of lively illustrations by Sophie Blackall--1-2 pictures per 2-page spread. We read the first one together to introduce her to the series. Since then, she has read some completely on her own, and we have taken turns with some of the others. Probably the best part is that they're funny! At one point, as my daughter was reading on her own, she started laughing so much she could hardly explain what was happening. Always a good sign! Luckily for all of us, there are many (many) books in the series. 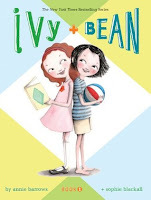 Ivy and Bean are second graders, and next-door neighbors who never meant to be best friends. To tell you the truth, Bean had always pegged Ivy as completely boring and possibly weird. 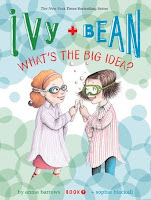 Despite her mother's suggestions to make friends, Bean always resisted...until the day she got into a rather tight spot and Ivy came to her rescue with an ingenious plan. That sealed it. They have been friends ever since. Read this one first if you possibly can. You could get by without it, but it's a great introduction to the series, and some later references will make a lot more sense if you've got this one under your belt. The rest can be read in any order. Ivy and Bean's second grade classroom has become obsessed with world records! Everyone wants to break one--after all, how hard could it really be to balance spoons on your face, or eat a whole bunch of M&M's? 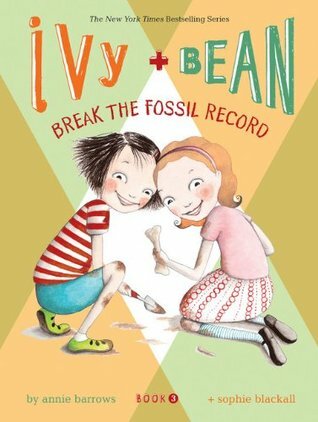 Ivy and Bean are desperate to be the first world record breakers in their class. After a few (rather unfortunate) false starts, they decide to become the world's youngest paleontologists. Bring on the shovels! 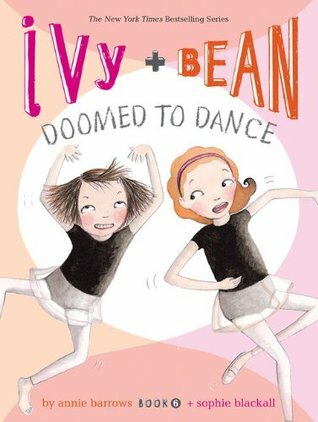 After reading a book about ballet, Ivy and Bean are absolutely certain that they must become ballet dancers. After some begging and pleading, they get to join a class--on the condition that they have to stick it out for the entire 4-month session. No quitting. They are not worried at all. Piece of cake! Until the first lesson, that is. Oh boy. This was not exactly what they had in mind. Only 15 lessons to go...unless they can figure out a way to get out of it. 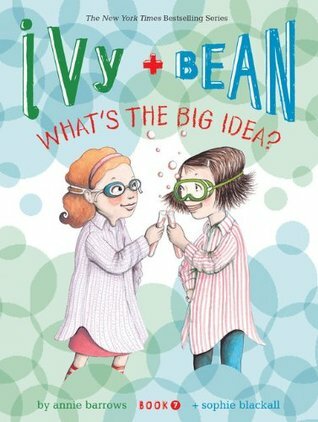 Book 7: Ivy + Bean: What's the Big Idea? The latest thing in the second grade is Belldeloon cheese. Well, perhaps it would be more accurate to say the packaging of Belldeloon cheese is the newest craze. You see, each individual portion is wrapped in red wax that can be used for all sorts of things. 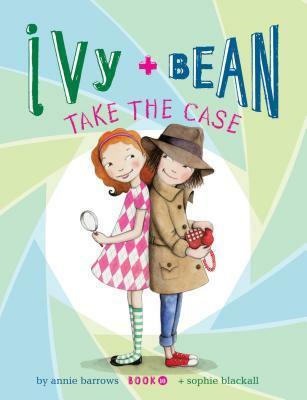 Ivy and Bean are determined to get their hands on some! Unfortunately, neither of their mothers will buy it for them. It costs $5 for a small package. So they need $10. Actually, what they really need is a money-making scheme. Pronto! After a discussion with Bean's dad, they decide on just the thing: they will write a neighborhood newspaper and sell subscriptions. All there is left to do is snoop around and find out some news-worthy things to write about. 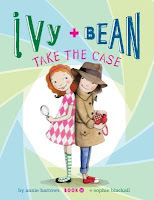 Ivy and Bean, girl detectives, are determined to solve all the neighborhood's mysteries. If only they can find some. Surely there must be something mysterious and unexplained happening on their street. They even get the neighbor kids involved. Just when it seems they leave on the most boring street in the entire world, a genuine mystery comes along. Who better to take the case? Though the protagonists are girls, I think the quirky situations and humor would draw boys in, as well. Have you read these? Any favorites we should be sure not to miss?